Next in our series of data-driven keys to effective advertising is a focus on Out-of-Home Advertising, looking at what works and what doesn't in this under-appreciated medium. Great OOH creative can deliver on Purchase Intent like nothing else! This is the first of three posts focusing on the best and worst of thousands of consumer-panel evaluated OOH ads. If you'd like to see other insights on good/bad ads in other media, see our resources page on Integrated Media in All Media Types. Who knew that Out-of-Home advertising scores higher than any other media type in Purchase Intent ... BUT only when the creative is good! Alas, since very few OOH ads are pre-tested, there are far fewer successful OOH ads than there could be. And there's much more to learn about this in our new, free eBook, "Four Data-Driven Keys to Effective OOH Advertising," which was beautifully designed by InspiriaMedia. How do we know this? We compared the effectiveness of a sampling of 25,000 ads from our normative database of more than 100,000 measured ads by media type to ascertain the strengths of both creative and mediums. 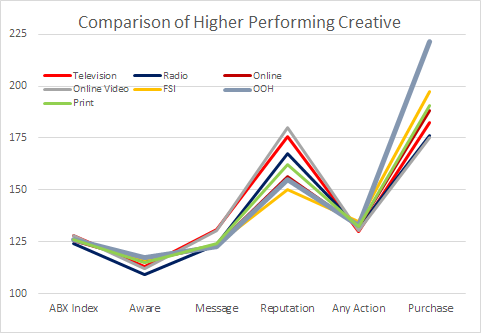 As you'll see in the chart below, the OOH advertising scores are represented by the thick blue-gray line, outperforming other media types and creative for both Awareness and Purchase. Awareness - do you know who the advertiser is? Messaging - is their a clear benefit and is it easy to understand? Reputation - do you feel better about the advertiser after seeing the ad? Call-to-Action - do you intend to take any kind of action as a result? As we've written in past posts, Likeability isn't on the list. It's good to produce ads that are Likeable, but this measure is not predictive. Think about some of your favorite ads, and then see if you can remember the advertiser! All too often, we can't. In OOH advertising, simplicity is king. Out of all the OOH advertising tested by ABX, this Subway billboard is a perfect example. Everything about it is clean, clear, inviting and simple. The ABX Index of 150 (+50% over norm) reflects its clear Message (+48%) and enormous Reputation score (+132%). Most important, the Call-to-Action score is also huge. Probably the most important element of Action is Purchase Intent (not shown) which is an incredible +281% over norm. If simplicity and clarity make a great OOH board, what do we make of this one? This is a perfect case of assuming our target audience knows who we are, or cares enough to go find out. While a Millennial audience might know, the rest of the world appears not to. Rating an incredibly low ABX Index of 29, (-71% below norm), this board earned virtually nothing in Awareness, Message or Reputation, and accordingly saw no Action (-43%). Remember your audience won’t work too hard to decipher your message. Join us for the next two installments as we see more high- and low-scoring Out-of-Home Advertising in each KPI. Or, sign-up for the new OOH eBook below! Are you satisfied with your current creative effectiveness? Is it resonating through Awareness and Message, and having an impact on Reputation and Action? ABX provides the largest normative database in the industry across all media types. On average you can improve your creative effectiveness by almost 20%. 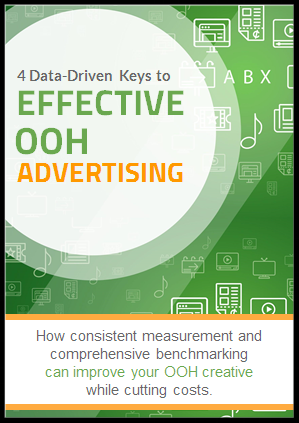 Free eBook - "Four Data-Driven Keys for Effective OOH Advertising"
Written by ABX President Gary Getto, this new eBook shares insights gained from the world’s largest database of benchmarked ads. You will learn the characteristics of powerful Out-of-Home advertising and how it can better drive results through real-life examples.